This book contains supplemental study information that can help you pass the DoD / CDSE Security Professional Education Development (SPēD) SFPC, SAPPC and ISOC certifiation exams and the NCMS ISP Certification exam. Some are reluctant to certify, but they just need the confidence earned through practice. and practice. It can help you prepare for the test. Using practice tests to augment your certificaiton exam preparation will help. This book is available for SPeD and ISP Certification and offers much more than what is currently found in other study manuals. It teaches insightful study tips designed to show you how to: form study groups, network, seek out opportunities, learn your way around the NISPOM and includes four exam length practice tests. According to reader comments and emails to the author, many who have bought this book, the and Test Tips, and used our techniques to augment their preparation have performed very well on the exam. This is the most important resource offering the largest volume and most comprehensive study questions available. Red Bike Publishing's Unofficial Study Guide gives you insight into test taking and has four 110 question length certification practice exams. 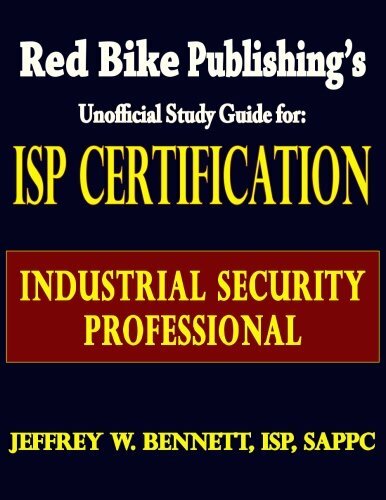 This book is designed to give practice questions to those who are eligible to take the certifications such as the Industrial Security Professional (ISP) and Security Professional Education Development (SPeD) certifications. We developed this book with the understanding that it will assist with certification exam studies, but should not to be used as a standalone product. Our intention is to compliment career experience and NISPOM guidance. This book is meant to compliment the federal regulations and executive orders bringing about the National Industrial Security Program. It is also designed to help the reader draw from experience and suggests ways to study for and take certification exams. Those who are new to the field can use this as a study guide. However, in all cases this is not a guaranteed single source option for passing the exam. The author's intent is to present practice questions to prepare you for the test experience and not to suggest actual questions that may be found in any certification exam. We do not know what those questions may be. We have made every effort to make this manual as accurate and complete as possible. It has been written by an ISP and SPeD certified author and has been reviewed and edited by some of the most experienced Facility Security Officers and ISP's in the business. 1. Contractors must obtain _____ approval before installing Intrusion Detection Systems. The security industry is booming and defense industry security specialists are benefiting. Departments of Defense, Department of Energy, the Nuclear Regulatory Commission, Central Intelligence Agency and many other Federal and supporting contractors are in great need of experienced and qualified security specialists, managers and Facility Security Officers. As the industry becomes more demanding and positions more competitive, today's security specialists need to be on top of their game. View More In Administrative Law. If you have any questions about this product by Brand: Red Bike Publishing, contact us by completing and submitting the form below. If you are looking for a specif part number, please include it with your message.